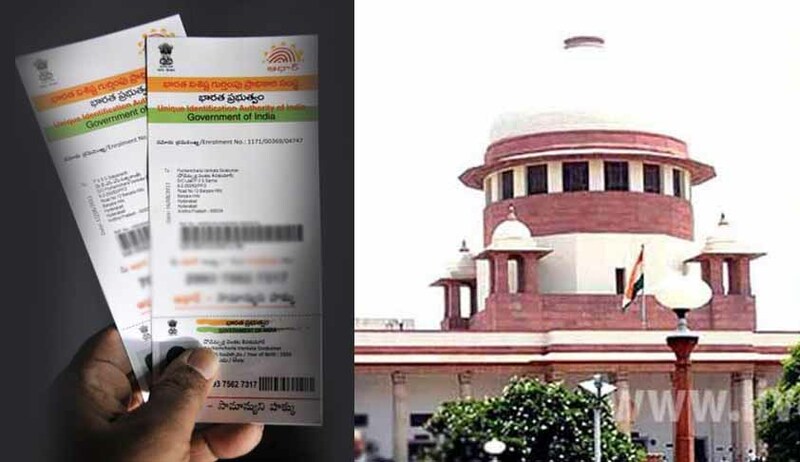 A new writ petition has been filed before the Supreme Court by Ramon Magsaysay Award winner Shanta Sinha and feminist researcher Kalyani Sen Menon challenging the vires of the Aadhaar (Targeted Delivery of Financial and Other Subsidies, Benefits and Services) Act, 2016. Petitioners also challenge the Notifications issued under Section 7 of the impugned Act, by various Ministries, making possession of Aadhaar number as a mandatory pre-condition for availing 17 social benefits schemes like Midday meal, Disability pension etc. The Petition filed through Advocate Vipin Nair is listed for hearing tomorrow, before the bench of Justices AK Sikri and Ashok Bhushan. Senior Advocate Shyam Divan will appear for the petitioners. IMPUGNED ACT CANNOT BE CATEGORIZED AS A MONEY BILL. There are several other patent flaws with respect to the impugned Act and the Aadhaar project. One of the most striking illegalities is the manner in which the impugned Act came to be passed as a Money Bill without having to secure passage through the Rajya Sabha. The impugned Act cannot in law be characterized as a Money Bill and the impugned Act is stillborn inasmuch as the mandatory legislative process has not been followed. At the time when the Bill was passed on 11.03.2016 by the Lok Sabha the attendance was merely 73 persons out of a Lok Sabha House strength of 543 members. Moreover, when the Rajya Sabha returned the Bill with suggestions/amendments, these came to be considered by the Lok Sabha on 16.03.2016 when none of the amendments /suggestions were accepted. Apart from there being no adequate debate or discussion despite the serious and severe impact of the Bill on civil liberties; the illegalities that renders the Act unconstitutional and ultra vires is its mischaracterization as a Money Bill and the failure to adhere to the constitutional legislative process. The Constitution of India like other constitutions that set out the basic law for democratic governance, employs an array of checks and balances to ensure open, accountable government where each wing of the government performs its actions for the benefit of the people and within its sphere of responsibility. The checks and balances are many and amongst them are the respective roles assigned by the Constitution to the legislature, the executive and the judiciary. Under India’s federal structure, with a distribution of legislative authority between the Union government and the States, the fields of legislation and corresponding executive authority are also distributed between the Union and the States. Provisions in the Constitution such as the fundamental rights chapter (Part III) and the chapter relating to inter-state trade (Part XIII) also circumscribe the authority of the State. These limitations on the power of the State support the notion of ‘limited government’. In this sense, the expression ‘limited government’ would mean that each wing of government is restricted by provisions of the Constitution and other laws and is required to operate within its legitimate sphere. Exceeding these limits would render the action of the State ultra vires the Constitution or a particular law. The concept of ‘limited government’ may also be understood in a much broader and different sense. This notion of a limited government is qua the citizenry as a whole. There are certain things that the State simply cannot do, because the action fundamentally alters the relationship between the citizen and the State. The wholesale collection of biometric data including finger prints and storing it at a central depository per se puts the State in an extremely dominant position in relation to the individual citizen. Biometric data belongs to the concerned individual and the State cannot collect or retain it to be used against the individual or to his or her prejudice in the future. Further the State cannot put itself in a position where it can track an individual and engage in surveillance. The State cannot deprive or withhold the enjoyment of rights and entitlements by an individual or make such entitlements conditional on a citizen parting with her biometrics. THE IMPUGNED ACTAS IMPLEMENTED COERCES INDIVIDUALS TO PART WITH THEIR PERSONAL INFORMATION. A citizen is entitled to enjoy all these rights including social and civil rights such as the right to receive an education, a scholarship, medical assistance, pensions and benefits under government schemes without having to part with his or her personal biometrics. An individual’s biometrics such as finger prints and iris scan are the property and entitlement of that individual and the State cannot coerce an individual or direct him or her to part with biometrics as a condition for the exercise of rights or the enjoyment of entitlements. Every citizen has a basic right to informational self-determination and the state cannot exercise dominion over a citizen’s proprietary information either in individual cases or collectively so as to place itself in a position where it can aggregate information and create detailed profiles of individuals or facilitate this process. The Constitution of India is not a charter for a Police State which permits the State to maintain cradle to grave records of the citizenry. No democratic country in the world has devised a system similar to Aadhaar which operates like an electronic leash to tether every citizen from cradle to grave. There can be no question of free consent in situations where an individual is being coerced to part with its biometric information (a) to be eligible for welfare schemes of the State; and/or (b) under the threat of penal consequences. In other words, the State cannot compel a person to part with biometrics as a condition precedent for discharge of the State’s constitutional and statutory obligations. The impugned Act inasmuch as it foists a Faustian Bargain on every citizen and resident is unconstitutional and deeply flawed at its very foundation. It is submitted that biometrics as a technology is unreliable and as applied by the Respondents is serving as an instrument of exclusion depriving persons who are otherwise entitled to financial and other subsidies, benefits and services from receiving these entitlements. Going by the stand of UIDAI itself, the number of cases where de-duplication resulted in the rejection of an application for an Aadhaar number is to the tune of 9 crores out of around 100 crore enrolments. The number 9 crores is just a little less than the population of the State of Bihar and twice the population of Odisha (as per the 2011 census). This shows that every 10th person is not being issued an Aadhaar number (though applied for) because of the flawed biometric technology being used. Further, one study using official data shows that the proportion of “false positives” i.e. duplicates being shown erroneously is unacceptably high, resulting in exclusion of those entitled to benefits. This study suggests that 1/121 is the proportion of false positives by a conservative estimate. This ratio is strongly indicative of the programme excluding individuals who should otherwise receive their entitlements. The accuracy of biometrics is highly doubtful for a variety of reasons: A person’s biometrics change over time; for persons who are engaged in manual labour and also persons who are aged, etc. ridges on the fingers smoothen out and cannot be captured effectively by biometric devices; and there is no safeguard at the crucial point of capturing the biometric that ensures the integrity of the process at the stage of enrolment. The impugned Act is designed to facilitate and encourage private sector operators to create applications that depend upon the Aadhaar data base for the purposes of authentication/verification. This would mean that non-governmental, private sector entities such as banks, employers, any point of payment, taxi services, airlines, colleges, schools, movie theatres, clubs, service providers, travel companies, etc. will all utilise the Aadhaar data base and may also insist upon an Aadhaar number or Aadhaar authentication. This would mean that at every stage in an individual’s daily activity his or her presence could be traced to a location in real time. One of the purposes of Aadhaar as projected by the Respondents is that it will be a single point verification for KYC (Know Your Customer). This is permissible and indeed contemplated by the impugned Act. Given the very poor quality of scrutiny of documents by private enrollers and enrolment agencies (without any governmental supervision) means that the more rigorous KYC process at present being employed by banks and other financial institutions will yield to a system which depends on a much weaker data base. This would eventually imperil the integrity of the financial system and also threaten the economic sovereignty of the nation. The impugned Act does not serve as an identity as incorrectly projected by the Respondents but serves as a method of identification. Every citizen-state and citizen –service provider interaction requiring identification is sought to be captured and retained by the government at a central base and a whole ecology developed that would require reference to this central data base on multiple occasions in course of the day. In other words, the impugned Act impermissibly creates the foundation for real time, continuous and pervasive identification of citizens in breach of the freedoms guaranteed under the Constitution.